Oh, how I love these rainy days. We just don’t get enough of them here in San Diego. I really love soup…I love making soup, but for some reason, I just can’t bring myself to make it unless it is raining. Soup and rain….they just go together. Don’t you think? Today I made chicken noodle soup. I threw in some broccoli at the last minute. Mm-mm-m-m-m. It is so good. Tomorrow, I think I will make chili. Chili with some homemade cornbread. I will post pictures and the recipe tomorrow. If it’s still raining, I may even do some baking. That’s if my knee isn’t causing me grief like it has been lately. I hate getting older….with age, comes aches and pains and crackly, crunchy knees. But that is an entirely different post. hahahhahahaha. 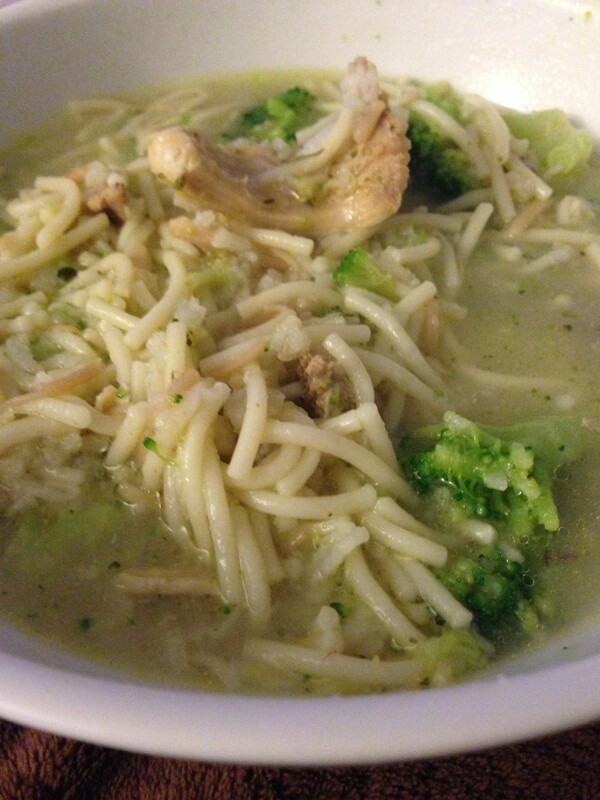 I’m sure you all have your favorite chicken noodle soup recipe, but here is mine….simple but comforting and oh so yummmmmmm. Boil one large chicken breast and one thigh in about 6 cups of water. shred the chicken and add it back to the water. Add seasoning salt and lots of black pepper. Add about 2 tsp of soy sauce. Add some broken pasta and 1/4 cup of rice. Let it cook till pasta and rice are done. That’s it! Throw in some veggies if you want, but it’s great without. Fill up a bowl, enjoy and sit and watch the rain. Next week I will start baking and painting turkeys!! Turkey sugar cookies that is…..no, not turkey flavor. Just yummy, buttery sugar cookies that look like the cutest turkeys ever. It’s a bit boring to paint them in the normal browns. So sometimes I dress em up…..get a little crazy with them. 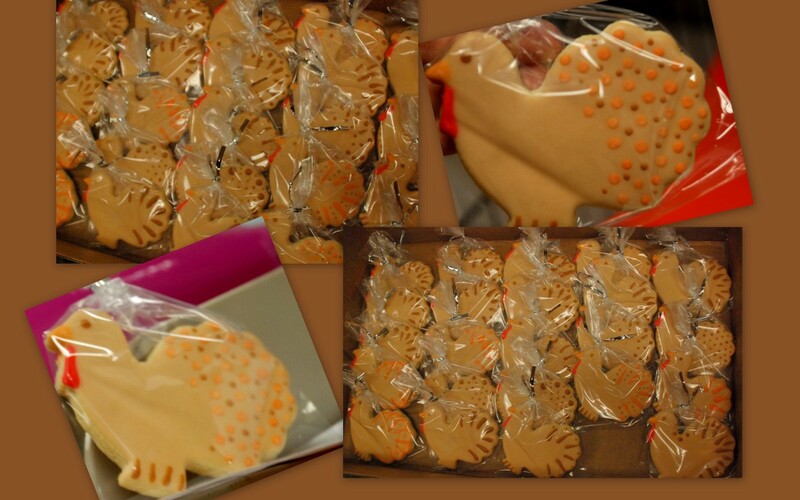 One year, my friend Patti……hi Patti…..and I baked a big batch of these turkeys. Well, we wanted color, so we painted pink and purple turkeys. Her hubby walked by the table a couple of times looking at the cookies with a puzzled look on his face. Finally he asked “are those turkeys? ?” Our turkeys looked like a bunch of floozies…like they were going out for a night on the town!!! We only did a few that way and then went back to a more traditional, BORING look. hahahhahaha. It was fun. Another time, I took a turkey cookie and put it between two pieces of white bread, slipped it into a sandwich baggie and gave it to a friend who loves turkey samiches. He got the biggest kick out of that. Anyway, if you would like to order some turkeys, just let me know. My email address is on my About Me page. Give these little guys a good home. You will “gobble” them up. hahahahaha, get it?? gobble them up? Ok, I’ll stop. By the way, they come in chocolate or lemon/vanilla. These pictures are last years cookies. 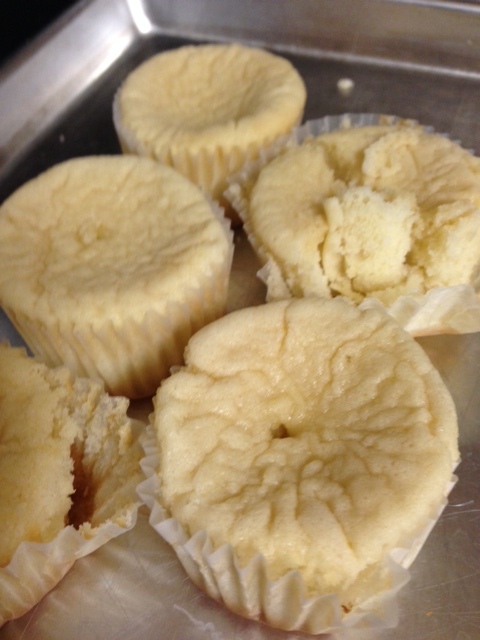 If you order, don’t worry, you will get a fresh batch….not last years cookies. hahaahahah. Ugliness…..ugly little babies…shriveled….wrinkly….shrunken…..I have no idea what happened. Amazingly, they taste really good. They have a nice texture, not too sweet. But I sure wonder what could have happened. Big sigh….I will try another recipe tomorrow. A day off and some baking…. I took a day off from the office today. Spent the day with a good friend, starting with breakfast at the beach and another good movie. If you haven’t seen Last Vegas, it is hilarious. You don’t have to be “old” to see it. It is so funny. How can you go wrong with Morgan Freeman and Robert De Niro? Michael Douglas..welllll….eh, not so much. LOL. Anyway, it was my favorite kinda day…..coolish, overcast….I love it. We stopped a local bakery and had a slice of pumpkin loaf. I am not a fan of pumpkin, so I don’t really know why I even ordered this. It was “ok”. 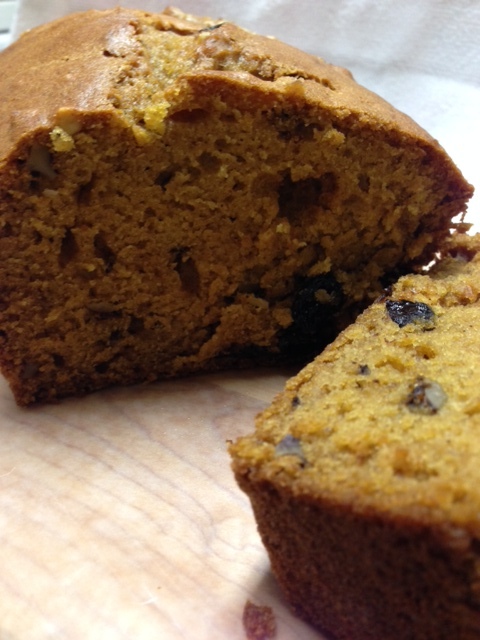 The only thing pumpkin that I like is MY punkin bread. I love this recipe and I only make it at this time of year. The aroma of cinnamon and ginger fills the house. It is delicious. 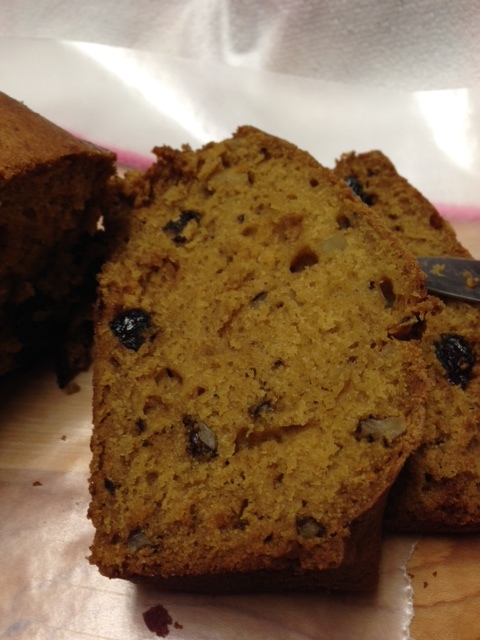 It is moist, full of toasted walnuts and raisins….m-m-m-mm-mm-mmmm. I had to come home and bake a loaf. Ahhhhhhhhh….it smells so good in the house right now. 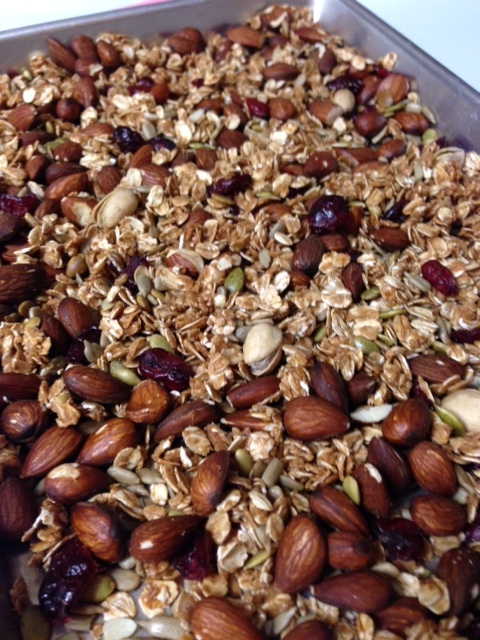 I also made some granola with almonds, oats, cranberries, honey and sunflower seeds. It’s yummy and pretty healthy too. Just a litle hint of sweetness from honey. Has a nice little crunch, crunch, crunch. If you would like the recipe for either, let me know and I will post it. My recipe index is taking longer than I had hoped. But it’s coming…. Happy weekend my friends….I survived the Halloween baking frenzy. I painted alot of cookies, dipped alot of mummy cake pops and baked some cupcakes. Whew…I am tired. Thank you to all of you who ordered treats from me! I needed some relaxation, so what could be more relaxing than a great movie. I just have to recommend this movie. Everyone must see it….seriously, go now! About Time is one of the best movies I have seen in a very long time. It will make you laugh, laugh, laugh and cry a little too. It will touch your heart. I loved this movie. I was a little hesitant when I heard it was about time travel. It is, but not really. It’s not like the time travel movies that have been out before. Nothing like those. Trust me…seriously…please don’t be turned off by that. It is romantic, it is about family and friendship, It’s funny. I laughed so hard in one particular scene, that I almost peed my pants. hahahahahah. Look for a new treat that will be posted tomorrrow….You will want to lick your computer screen, I’m tellin ya….YUM.